It was just after dawn, on a lovely day in the Month of Hunting in Year 14. Most of Neopia was either still asleep, or just waking up; even the sun seemed tired as it rose sluggishly over the east horizon. But on the deck of a ship called The Nomad, a lupe named Roxias was already wide awake and about to start his daily forms. Roxias unsheathed his sword and raised it in a warrior's salute, then, holding his shield in front of his left and most vulnerable side, he bent his knees and began moving back and forth, back and forth, keeping his stance as wide and his body as low as possible. He maintained this position as he practiced his lunges, parries, and strikes, getting faster and more forceful as he went. For more than an hour he did this, till finally, he lowered his shield, sheathed his sword and sank onto a crate, gasping for breath. "Yeah, you really taught that thin air a lesson," said a female voice. Roxias jumped, then turned to see Scout looking at him from behind the wheel. "I thought that we weren't hoisting anchor for another half-hour," said Roxias. "I couldn't sleep anyway, so I figured I'd go ahead and get us on our way," the yellow Zafara replied. "But you can keep stabbing at nothing if you want to." Roxias frowned at her. "Those were my forms. Don't martial artists have those as well?" "Yeah, but ours don't look quite as ridiculous as yours," Scout replied. She hoisted the anchor with seemingly little effort, then headed back to the wheel. "We should get to the Shenkuunese docks in a couple hours. You still want to see it, right, Danger Magnet?" Roxias frowned at her. "I wish you wouldn't call me that." "Oh, I'm sorry. SIR Danger Magnet." "That's...not better. I'm not a knight yet, I'm just a squire. That's the whole reason I'm on this pilgrimage," Roxias reminded her. A while back, King Skarl had decided that, before Meridellian squires could become knights, they had to go on a year-long pilgrimage through Neopia. Roxias had started his about three weeks ago. So far, he'd only been to Faerieland and Mystery Island, where he'd met up with some old friends of his family's, the Capernaums and Granpa Hansuke. After a little misadventure, Grandpa Hansuke had decided to journey with Roxias, and, per his insistence, they'd taken The Nomad as transportation. Scout's aunt, Mo, had forced her to come along as well. She seemed to think it would do the Zafara some good to take a break from her routine of helping out in her family's inn, training at the Secret Ninja School, and competing in Faerie cloud races. They'd left Mystery Island two days ago. After a day of sailing around, looking at some small islands in the sea surrounding Mystery Island, they'd decided to go to Shenkuu. 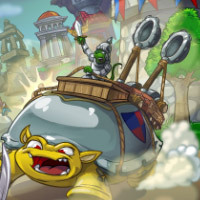 Roxias had never seen it, since it had opened up to the rest of Neopia when he was busy with his squire training, but his family had told him lots of great things about it, and he was rather looking forward to the visit. Roxias didn't want to show up at Shenkuu for the first time in a sweat-stained tunic, so he went below deck to clean up and change. When he got to his room, Grandpa Hansuke was already awake and mixing a fresh batch of what he had dubbed "Nyoom Juice," a peculiar orange liquid that seemed to make whatever container it was in smoke. "Scout try to push you overboard and sail off without you?" the elderly yellow Ogrin questioned. "Er, no, not yet. I've been doing my forms," explained Roxias. "Ah, yes. You know, Tobi used to do that at the crack of dawn, too. Of course, his were different since he wizard, not knight. Drove all of us crazy, until we finally decide to join him and make competition of it. He won most of time, but I came pretty close to tying with him in victories," chuckled Grandpa Hansuke. He and Roxias's adopted grandfather, Tobias Elbuort, had once been part of a group of adventurers who had sailed Neopia, along with a lenny named Evans and a Zafara named Max, Scout's late grandfather. Grandpa Hansuke had settled down on Mystery Island to help with Max's Inn and with raising Scout after Scout's mother passed on, but his hunger to return to adventuring had driven him to join Roxias on his pilgrimage. Roxias smiled slightly at Grandpa Hansuke's anecdote as he rummaged through his backpack until he found a clean tunic and trousers. He suddenly realized that the ship bathroom only had a toilet. "Er, how would one clean themselves if the ship was in motion, and one couldn't swim in the sea?" "Oh, that easy. Just use closet," said Grandpa Hansuke. Grandpa Hansuke stood, and walked over to the closet. He knocked on the door three times, and said loudly, "I wish for tub." "I don't think that's how it-" began Roxias. Grandpa Han opened the door to reveal that the closet had transformed into a full-sized room with an enormous bathtub at the center. "...Works," breathed Roxias, stepping inside and staring around in disbelief. "This ship originally from Elbuorts. Family full of wizards with too much time on their hands. You really think they not put a few surprises on this ship?" asked Grandpa Hansuke with a wide grin. He showed Roxias how to work the tub's many faucets (some poured water, some bubbles, some scented oils), then left him to his bath. Roxias meant to quickly clean himself, but the amazing tub seemed too nice to leave after just a few minutes, so by the time he re-emerged on The Nomad's deck, clad in a clean tunic and smelling faintly of pine trees, they had already docked. "Ah, I was wondering when the mighty Roxias would grace us with his presence again," said Scout, adjusting her blue fishing hat. Roxias winced. "Sorry, I-"
She held up a hand. "It's fine. I like you better when you're not around, anyway." With that, she leaped over the boat and onto the dock, and strolled off towards the steep road that would take them up the mountains to Shenkuu proper. Roxias shook his head, but he and Grandpa Hansuke went down the gangplank and followed her. "You going to have a lot of fun in Shenkuu, I promise," said Grandpa Hansuke. "They got lots of great food, an amazing weapons shop, and oh, kou-jong! That lots of fun!" "Are you sure you're okay to walk up and down the mountain every day?" asked Roxias, concerned. "I bet there's an inn up there we could stay in if you're not up to-"
Grandpa Hansuke hit him over the head with his cane. "What, just because I old, you think I going to let something like a mountain get to me?! I just as spry and twice as experienced as you young 'uns! If anything, YOU need to worry about keeping up with ME! Now, good news is, Shenkuu not have much by way of threats, and mountain is excellent terrain for defense if they ever do, so most we should have to worry about is rogue ghosts, vampires, and of course bandits. And the Sway." "The Sway. Group that attempts to manipulate Neopians to control Neopia from the shadows? They got agents everywhere, so be prepared at all times. You never sure if they'll decide you too much trouble," said Grandpa Hansuke seriously. "I...don't think we need to worry about that," said Roxias slowly. "Fah! Fine, don't believe me! But someday I going to find way to prove they exist, and when you see them, you AND Scout finally learn that I know what I talking about!" huffed Grandpa Hansuke. He picked up his pace, and was soon walking faster than Scout. Roxias shook his head. So Scout was the mostly sane one, but didn't care for him much, and Grandpa Hansuke seemed to enjoy his company, but was a few plums short of a fruit pie. If only he could find some way to combine the two, he'd have the perfect traveling companion. Ah, well. Neither was totally unbearable, so hopefully, this pilgrimage would go just fine whether or not they changed. Just like Grandpa Hansuke had predicted, Roxias loved Shenkuu. Its mountain geography and strange architecture was fairly different from Meridell, but the society had quite a few similarities. There was a ruler overlooking the entire country, and nobles who ruled their own little patches of it. And the ruler had a group of soldiers who had sworn to protect the land and its people, though they were called samurai, not knights. There weren't as many farmers here as there were merchants, though, and they passed their free time with more games meant to challenge the mind, like kou-jong, than games meant to challenge the body, like archery or cheese roller. Roxias spent most of the day just exploring, but Grandpa Hansuke finally dragged him off to play kou-jong that evening. Scout, who had spent a great deal of the day crooning over weapons in the weapons shop, went along, claiming that it would be entertaining to see how badly a Meridellian squire would do at it. "I mean, King Skarl isn't exactly renowned for his brains, so I doubt he's the type who makes sure his soldiers are the best and brightest." Roxias glared. "As I recall, I was smart enough to help YOU when that Kyrii framed you for robbing the Hidden Tower." "So you got lucky once. Whoop-de-doo," drawled Scout. A pretty pink Kougra beamed at them when they walked in. "Hello. Here for a sporting game of kou-jong, I suppose?" Roxias stared at the Kougra blankly. His tongue suddenly felt like it was made of jelly, and to make matters worse, his knees felt weak. Grandpa Hansuke clasped his shoulder, and spoke for him, "That right, we are. Here, Roxias, I go first, I show you how it done." Roxias nodded, and sank onto a nearby cushion. Scout snickered as she sat down on the cushion next to him. "Oh yeah, if every fighter in Meridell is like you, I feel real confident in that land's future." "Hansuke. It's so good to see you again," said the Kougra as Hansuke sat down across from her. "How's the memory coming?" "Well meeted....er, met, Linae. Oh, most everything's back now, except for some grammar and the Tombola accident itself, funny enough," Grandpa Hansuke replied. "Don't worry, I DO remember how to whoop this game." Linae smiled. "I'll believe it when I see it." She stacked several painted tiles. Grandpa Hansuke watched carefully, clearly trying to memorize the set-up. Once she finished, Grandpa Hansuke set to pairing them up. Roxias watched in amazement as the Ogrin made short work of the game, hesitating only once or twice. The table was cleared within two minutes. Linae set up the tiles two more times, and Grandpa Hansuke matched them up just as quickly as he had the first round. Finally the game was done, and Grandpa Hansuke shot Linae a triumphant grin. "Told you I still got it!" "Yeah, but you're nowhere close to how good you used to be," replied Linae. "Eh, give me time, accident was only four months ago," said Grandpa Hansuke, waving a hand dismissively. Roxias decided to start off on the easy mode. He had to start the first round over and didn't receive any bonus points, but he picked it up fairly quickly. Kou-Jong was a game of strategy as much as it was matching; you had to make sure your matching tiles weren't "trapped" by the others, or you'd wind up unable to match up all of the them. He played two more games in easy mode, then a game in medium mode. Scout didn't seem very happy about his success. Roxias grinned and her and questioned, "Still think I'm more brawn than brains?" "Beginner's luck," Scout retorted. When she played, she messed up more than once. She took too many risks, and a number of them backfired. And the more they did, the more irritated she became, and the more sloppily she played. She only played two games before she stormed back to the corner, a thundery expression on her face. The Zafara was in a bad mood for the rest of their time in Shenkuu proper. She kept glaring at Roxias as though everything were his fault. Roxias tried to ignore her, and simply enjoy this new land. After they finished up at Linae's, they headed to a little hole-in-the-wall restaurant, Chow Down, where they bought dinner. Roxias stared at the bowl of noodles and chicken before him. "Er, where's the dining ware?" "On the napkin," replied Grandpa Hansuke. Roxias looked, and saw two small sticks on the napkin. "...Oh." "You've never seen chopsticks before?" asked Scout, in a tone that made it clear she thought Roxias was quite uncultured. "No, I have, Jaylie went through a phase when she was fourteen where she ate all of her food with them, but I've never eaten with them myself," explained Roxias. It took him a few minutes to figure out how to hold them. Scout's smirk grew wider and wider as she watched. Roxias pretended not to notice, but his red ear tips made it obvious that he was embarrassed. When dinner concluded, they went to the Lunar Temple, and ran back out a few minutes later, dragging along Grandpa Hansuke, who was waving around a bitten green apple and yelling at the Gnorbu in charge of the temple for "rigging" the star charts. They were almost to a bridge when they bumped into another yellow Ogrin, this one in a white robe, who stumbled backwards. Roxias quickly ran over to the Ogrin and steadied him. "I am so sorry, sir, I didn't see you there!" "Me neither," replied the Ogrin with a smile, and Roxias suddenly realized that he was blind. And the Ogrin Master. He had just made a "seeing" comment in front of the OGRIN MASTER. He felt his whole face redden. "Oh, I am SO sorry, I didn't....I wasn't..."
Scout gave Roxias a thumbs' up and mouthed "Smooth," her bad mood entirely gone now that Roxias had humiliated himself enough. The Ogrin Master chuckled. "I'm joking, young man. As far as I understand it, they do have jokes in Meridell, correct?" Roxias blinked. "How did you know...?" "Your accent. I can practically smell marrows and hear the croak of Mortog with every word you speak," said the Ogrin. "Hmm, he not wrong about that," said Grandpa Hansuke. The Ogrin beamed. "Is that Hansuke I hear?!" "No, it Queen Fyora. Of course it me!" replied Grandpa Hansuke. The Ogrins embraced, and began talking happily. Roxias looked at Scout. "...Grandpa Han knows the Ogrin Master?" "In between your grandfather, Grandpa Han, and Evans, I'm pretty sure there's no one in Neopia that the Golden Quartet DOESN'T know," Scout replied. To their astonishment, the Ogrin Master offered them a room for the night. To their greater astonishment, Grandpa Hansuke declined. "Would not want to crowd you," he said as Scout frantically gestured for him to stop talking. "Besides, we got all we need on The Nomad." "Alright, then at least visit me for tea tomorrow. You're an oolong man, as I recall?" "Well, he sure isn't chamomile," muttered Scout. Grandpa Hansuke whacked her over the head with his cane, then addressed the Ogrin Master. "We be happy to." The Ogrin Master bowed. Grandpa Hansuke bowed in return, as did Scout and Roxias, and then they went their separate ways. Scout seemed truly happy for once as they made their way down the mountain. "Okay, this day wasn't COMPLETELY horrible after all, and tomorrow's looking pretty good. I mean, tea with the Ogrin Master! He's the proctor for the martial arts part of the Imperial Exam, AND there are rumors he oversees the Shenkuu ninjas!" "I thought Shenkuu had samurai," pointed out Roxias, confused. "Sure, by day. But by night, they've got an elite class of ninja warriors who guard the Imperial City and the villages," replied Scout. "Well, the ninjas guard some of the poorer villages who can't afford as many samurai as they need by day, too. And they've got sorcerers, though their magic's different than most. So they've got three types of defenders, not just two. Meridell could stand to learn a thing or two from them." Roxias scowled at her. "Doesn't Mystery Island only have the ninjas to guard them?" Scout frowned for just a moment before replying, "Well, that's all Mystery Island NEEDS. We make sure our warriors are competent enough to handle ANYTHING, unlike SOME lands." She sauntered off. Roxias muttered to Grandpa Hansuke, "I thought you said she was warming up to me." Grandpa Hansuke shrugged. "I guess she have little relapse." "Trust me, if she HATED you, you'd know it by now. Just give her more time, and I sure she'll come to like you." Roxias sighed. "I'll be old and grey by that point, won't I?" "Probably. And even if she not like you by then, at least you'll probably have hearing loss and won't have to deal with her insults as much," said Grandpa Hansuke cheerfully. After tea the next day, the Ogrin Master took them on a tour through the Imperial Palace. Grandpa Tobi would tell him what things looked like, and he would tell them what they were. Roxias tried not to gawk. "And this is the examination hall, where we test scholars once a month," said the Ogrin Master when Grandpa Hansuke told him they were near a door with a bluish-green Kacheek and several guards. "The top scholar is sent to work as one of the Emperor's scholars." "Oh, yeah, there's a game about this," remarked Scout. "Yes, well, the real test to even get inside the hall is a little more complicated than spelling out a word," said the Ogrin Master. "You must prove yourself capable at basic writing AND mathematical skills, and you can take the entrance exam any time of the month. If it gets a passing grade, the palace will contact you and give you a pass into the hall the day of the big exam. But that Kacheek, Zei, IS the one who checks them all to ensure that they're good enough." Zei smiled and bowed at them as they walked up. "Good morning, sir. Taking some friends of yours on a tour?" "I am, indeed. Receive any new applicants today?" asked the Ogrin Master. Zei made a face. "Yes, sir, nineteen. Three couldn't even spell their own names. It might have just been nerves, but really, they shouldn't've put this off till the day before the big exam. I don't know why so many Neopians procrastinate like that." "Ah, well. You don't want people like that as your scholars, anyway, if they think so little of this job that they wait till the last minute to apply for it," said Scout. Zei nodded vigorously. "Yes, thank you, Miss...?" "Scout. Just Scout is fine." "And I'm Zei, but, I guess you knew that," said Zei with an awkward smile. He looked at Roxias, and his eyes went wide. "As I live and breathe! An Elbuort!" Roxias blinked. "I'm...I'm sorry, have we met?" "No, but I've met your family, and they've shown me your pictures dozens of times! They're all so proud of their squire big brother! And soon to be knight, if I recall Avvie's gushing correctly." Roxias smiled at the thought of his Shoyru sister. "That's right. I'm on the pilgrimage right now, actually." "That's fantastic! You know, I've never met a knight, or even a would-be knight! I have so many questions!" "Hey, you know, I'm in training to be a Mystery Island ninja," piped up Scout. Zei looked like he might faint from sheer delight. "An Elbuort AND a ninja-in-training?! Oh my stars, this IS my lucky day! Here, let me get out a scroll and a brush so I can write things down-"
A blue Grarrl guard cleared his throat. Zei flushed. "Then again, maybe it should wait till I'm off the clock. If you're okay with staying in the city till dusk." Roxias didn't have the heart to tell the eager Kacheek no. "Uh, sure." "Then I'm okay with it, too," piped up Scout, shooting Roxias a triumphant look, though he wasn't sure what she was supposed to have won. The Ogrin Master chuckled as they walked away. "Zei is a nice young man, and very scholarly himself. He wants to know everything there is to know about Neopia, but he especially enjoys learning about its heroes." "Oh, I'm no hero," said Roxias, embarrassed. "Feh, unless you count clearing someone's name and helping save an inn," said Grandpa Hansuke. Roxias's ear tips turned red. "And, as you undoubtedly know, your grandfather was a legend, and your clan was once renowned throughout Neopia," said the Ogrin Master. "I'm amazed Zei didn't ask for your autograph." Roxias wasn't sure how to process this. He'd never had a fan before, unless you counted Avvie, Jiopuyd, and Babbles, and it had never even occurred to him that someone might consider him worthy of hero-worship. Come to think of it, though, maybe he should expect a fan or two once he became a knight. After all, HE'D idolized many a knight besides Sirs Jeran and Tormund growing up. He still had an autograph book full of signatures back at home. Would someone really want his signature in theirs? Then again, Zei mostly seemed to admire him because he was an Elbuort. Not because of anything he’d done, not even because he was going to be a knight someday, but because he happened to have the same last name as a famous clan. Was that really the sort of fame he wanted? Did he really want to be stuck as AN Elbuort, not ROXIAS Elbuort? He decided to put the thoughts aside for now. Fretting about the future only ruined the present, and besides, the Ogrin Master was in the middle of describing a pretty interesting battle. Scout frowned when she saw a young pink Kacheek with brown hair full of ribbons "accidentally" brush shoulders with Roxias and walk away with some of the lupe's Neopoints and a self-inking quill, but she didn't say anything. It served him right for making her look stupid at the kou-jong lady's last night. They met Zei at his desk outside the examination hall for the interviews, which went well, though they weren't short by any definition of the word. Every time they thought the Kacheek had run out of questions, he popped another one. Finally, though, he wrapped up the scrolls and said, "Alright, I guess that's enough for today. Thank you so much!" "You're quite welcome. Uh, do you want to get dinner?" asked Roxias, unsure how he should treat a Kacheek who acted like a fan. Judging by Zei's awed expression, this was not the usual route. "Really?! Wait, no, I can't, I can't." "Why not? You're off the clock, right?" asked Scout. "Technically, but I have to get these tests to my quarters for safekeeping," explained Zei. "Oh," said Roxias, slightly relieved. Zei seemed nice, truly, but he wasn't sure if he could handle that much awed staring over what was supposed to be a relaxing meal. "I understand. Maybe next ti-"
"OR this time," piped up Scout, in a far too cheerful voice. "There's a guard right there, right? So let him do his job, and guard the tests till you get back." Zei frowned. "I don't know...."
"C'mon, who'd steal a test?" asked Scout. The Kacheek didn't need much convincing. Soon, they were on their way to Chow Down. Roxias suspected that Scout was only treating Zei to dinner to annoy him, but he did his best to be polite nonetheless. When they reached the restaurant, he pulled out his Neopoints, and frowned. "Yeah. I could've sworn I had more than this this morning, and I know I haven't bought anything today," said Roxias. He shrugged. "I must've miscounted." A few minutes after they'd left, the reason Roxias didn't have as many Neopoints as he'd thought arrived at the examination hall, along with a blond-haired human boy about ten years old. They nodded to each other, then the human boy ran over to the blue Grarrl guard and wailed, "Please, sir, you gotta help me!" The Grarrl was surprised. It wasn't often that a human so young showed up here alone. "Something wrong, son?" "It's my parents! We were here with our Neopets, but I got lost! You gotta help me find them!" wailed the boy, then he burst into tears. The Grarrl shot the tests a look. Well, the child did seem pretty upset, and like that Zafara had said, who was going to steal a test? This human cub needed him more than some papers. "Oh, alright. What's your name?" "Well, Hank, I'm sure we'll find them soon," said the Grarrl. Once they'd walked off, the pink Kacheek crept over to the tests, and sorted through them till she found one labelled "Den." She clicked her tongue in disapproval. "You couldn't even spell your name right? Really, Dan?" She pulled out a blank piece of parchment, and, careful to mimic the handwriting on "Den's" test as best as she could, she wrote down the answers. Once she was done, she took the incorrect test, stuffed it in her pocket, and skipped off, whistling a merry tune. When the Grarrl came back, he didn't notice anything amiss. Zei, Scout, and Roxias returned half an hour later in high spirits. Well, Zei and Roxias were, anyway. Now that Zei had spent more time with Roxias, he'd become more of a friend than a fan, and Roxias found that much less stressful to deal with. Scout, on the other hand, didn't seem too happy about it. Zei picked up one of the tests and frowned. "Huh. That's funny. I could've sworn I graded this already. Ah, well." He pulled out a brush, and quickly gave the test a passing grade. He gathered the other tests up, and headed for the examination hall door. "Well, thanks for dinner." "Anytime," answered Roxias with a smile. Scout huffed, then questioned, "So what, you live in the examination hall?" "Well, actually, I live in the personal quarters right next to it, but yes," replied Zei. The hall doors opened just long enough to allow the Kacheek inside before they slammed shut again. "Protective of that hall, aren't they?" asked Scout. "It connects to the rest of the palace. If they left it open, a thief could just waltz right in and-" began Roxias. "No one asked you, Danger Magnet," said Scout, and she whirled around and marched off. Well, at least he'd made ONE new friend today in Zei, Roxias thought as he followed. And he'd been given a tour of the Imperial Palace by the Ogrin Master himself. Nothing, not even Scout, could sour this day for him. But, unbeknownst to him, someone HAD just done their very best to sour tomorrow.